Winter is less than a month away. As you enjoy the Christmas holiday, you might run into some navigation issues due to the thick snow all around. How do you prepare for these challenges? 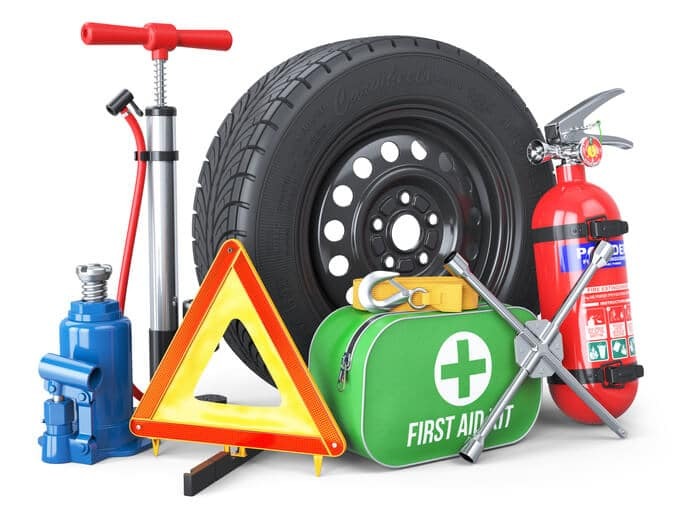 We encourage you to get a car emergency kit. This kit enables you to make quick repairs and enhances your survival during accidents or major traffic snarl-ups that take more than a day. 1. What should be inside your kit? Jumper cables are important because they can help you get out of a dangerous place fast. Assume that your battery runs out near an isolated dirt road near a forest that’s known for muggings and ruthless carjacking. The longer you stay stranded, the more danger you stand to face. A Good Samaritan will help you juice up your battery and drive to safety as soon as possible. Apart from insecurity, the subzero temperatures experienced at night are fatal to children and adults with chronic pulmonary illnesses. Keep your cables dry at all times to prevent the crocodile clips from rust. A snow shovel enables you to create a way for your car to move in or out of a driveway. After parking your car overnight, you’ll need this tool to get rid of the snow around your tires and bumpers. Is it different from an ordinary shovel? Yes, it is in terms of size and weight. A typical shovel is approximately 4 feet in height but this tool is just half the size and much lighter. It’s also has a detachable blade so that you can put it under a seat when carrying it inside cars with limited storage space. Imagine your car halting abruptly at night on a road with virtually no traffic. So, you decide to get out, pop the hood, and see where the problem occurred. However, doing this might be putting yourself at risk. Why? Because the darkness brings about poor visibility. This increases the chances of a motorist accidentally knocking you down. How do you avoid such accidents? By getting roadside flares. They’re better than warning triangles because they illuminate light while triangles act as mere reflectors. Roadside flares are also more visible and this makes it easier for emergency response teams to spot you. Roadside flares go hand-in-hand with safety reflector jackets. The former notifies other motorists that there’s an incident ahead. Safety reflector jackets make you visible to other motorists on the same or opposite roads. Why is visibility important? Because it helps you file for compensation successfully in a personal injury lawsuit. You have a strong chance of winning when the defendant ignored your roadside flares and reflector jacket on your back. Unlike raindrops, one cannot simply wipe off the snow that’s covering a windshield. Why? Because the snowflakes tend to harden up when it starts gathering into a pile. How can one get rid of this white layer without cracking or breaking the glass? By getting a windshield scraper. You can use one scraper for a subcompact as well as an SUV because the handle is extendable. It’s a one-time expense since you won’t have to buy any replacement parts. Plus, you can use the same scraper for almost a decade. Sometimes, you’ll come across road sections that are so slippery that even cars with snow tires sway from side to side while trying to maintain a straight course. That’s because there’s insufficient friction between the tires and icy road. Is there an effective solution to this problem? It’s advisable to carry dry sand in a 5-gallon bucket. Pouring and spreading it all over slippery roads increases traction and this directly improves your safety while driving. Make sure you carry it in a bucket with an airtight lid to keep out moisture. Water keeps cells and tissues in our body alive by keeping them hydrated. It also helps the body get rid of toxins and maintain an optimum pH for perfect metabolism. When the body runs out of water, you may experience a dry throat and headaches. Smart drivers always carry a gallon of safe drinking water when traveling alone for long distances. If you’re traveling in a family of four, then you need two gallons of clean water to stay hydrated. Doing this prevents you from drinking contaminated water from unfamiliar sources. First Aid kits are a must-have at home, in the office, and restaurants. You can save lives or prevent the spread of infections when you have a well-stocked kit within arm’s reach. Car first aid kits are affordable and not just stocked to treat cuts and bruises that may arise in accidents. So, how does one ensure that they have a fully-stocked kit? Find out whether any of your passengers have allergies or chronic illnesses like Asthma or Diabetes. Then, go to the drugstore and purchase several antihistamine medication and inhalers. When you experience a puncture at night on an isolated road, you need light to help you find your spare tire and jack. Light enables you to position the jack correctly and replace your punctured tire. You need a good long lasting source of light that’s preferably waterproof. In addition to helping you change flats, a flashlight can help you communicate with emergency rescue teams located a mile away from you. How is this possible? By sending SOS signals. You can also send detailed messages using Morse code. A tow cable enables you to become a Good Samaritan and also helps you get out of bad situations fast. When you’re traveling with friends on a road trip and one of the cars breaks down, it’s possible for you to tow it to the nearest mechanic without spending a cent on towing charges. On the other hand, you might experience mechanical problems on a lonely road and there’s no hotel or motel near you. Rather than risk spending the night out in the cold, you can dial 911 and have a rescue team tow you to safety. Do you usually refer to Google Maps while driving? It’s quite frustrating trying to type directions with one hand while balancing the steering wheel with your other hand. Why? Because when you hit an unexpected bump, it messes your spelling and you have to restart typing locations. A cellphone adaptor enables you to use Google Maps without compromising your safety while driving. You can mount it on either the dashboard or windshield so that you can view the maps conveniently. This tool also makes it easier for you to use Siri or Google Voice Assistant by placing your phone much closer. No sane person enjoys getting rained on. The cold wetness feels miserable and brings about flu. The wetness also makes your car damp because the seats end up soaking water dripping from your clothes. Plus, it also affects delicate electronics stored inside your pockets. Owning a raincoat enables you to change car tires without worrying about water constantly flowing into your eyes. All you have to do is pull the hood to deflect incoming raindrops. You also avoid getting your car damp and musty because the raincoat keeps your clothes dry. Most survival kits designed for camping and long-distance excursions contain food energy bars. What do they consist of? Nutritionists recommend a combination of high-calorie food designed to keep you energized for extended periods without having to feed regularly. They work the same way as MREs (Meal-Ready-to-Eat) consumed by military personnel. Energy bars are ideal when you find yourself trapped in a situation lasting more than 6 hours. Some brands also contain a variety of nuts to ensure that you consume a balanced diet as you wait for rescue teams to arrive. They’re also manufactured to last for several months without perishing. Sometimes one has to put up with a terrible traffic situation overnight due to several reasons. For instance, a major storm makes visibility so poor that rescue teams have to postpone search and rescue activities for several hours. In order to beat the biting temperatures, you need a nice thick waterproof blanket. A waterproof blanket prevents moisture accumulation. This enables your body to stay warm and keep your clothes dry even while resting outside your car. This is a must-have when traveling with children, expectant women or senile passengers. Why are these two items important? Because you need them for navigation. If you’re stranded in an unfamiliar place without gas, you can meet a Good Samaritan who will draw you a map to the nearest gas pump. It’s more reliable than trying to recall whether you’re supposed to turn left or right when you reach a particular junction. Having a pen and paper in your pocket can also help you note down the landmarks near you. This information is important when communicating your exact location with emergency responders combing the area for victims. Fires occur when you least expect them. Take, for instance, this woman, whose powerbank exploded while riding inside a bus. This incident can happen to anyone while driving to work or school. In order to deal with the fire immediately, rather than dive out of a moving car, you need a fire extinguisher. It helps you minimize property damage because you extinguish the flame in a matter of seconds, making it hard to spread to your accessories. Car fire extinguishers also help you minimize repair costs for drivers without comprehensive insurance. By dealing with the fire promptly, you stop the flames from spreading to your seats. Every veteran driver always has a roll of duct tape in his or her car. It doesn’t matter whether it’s old or a brand new set of wheels. When ice falls and breaks your window, you’ll need a temporary fix while driving to the mechanic. What will you need to get the job done? Duct tape, a piece of cardboard, and a pair of scissors. Duct tape also helps you fix faulty wires. It enables you to fasten loose wires on the clips connected to your car battery. When your child pierces holes into the dashboard using a screwdriver, you can seal them up using a roll of duct tape. Sometimes, a driver can leave in such a rush due to excitement or pressure from friends to get the road trip started. In this situation, one can go on a long distance trip without checking their motor oil level. In order to avoid overspending and running into a series of challenges, always carry a can of winter motor oil in your emergency kit. A car running on insufficient oil ends up developing mechanical problems due to lack of coordination between moving parts. The uneven oil distribution makes certain parts immobile. Some days on the road can get really bad. For instance, experiencing a puncture right after the low fuel light starts blinking. Perhaps the nearest gas station is 2 miles away and there no cabs to help you get there faster. You’ll need a no-spill gas can to refuel and resume your journey. A No-spill gas can enable you to refuel your car without spilling gas on your clothes. This prevents accidental fires when you light a cigarette. You can also get various sizes depending on your type of car. In addition, they’re really affordable. A smart driver always carries a toolkit packed with different-sized screwdrivers, pliers, and tire plugs. You also need a set of spanners to sort out various engine problems. For instance, replacing a faulty ignition switch. You can carry out this replacement as long as you can identify every engine component under your hood. A set of screwdrivers and a bottle of adhesive come in handy when plugging car tires. You can resume your journey within five minutes or help a stranger who has a busted tire. It also helps you to replace the bulb in your interior light. When your car won’t start after replacing your battery, you’ll use the test light inside your toolkit to check whether current is flowing. This helps you to distinguish battery problems from wiring issues. Forgetting to carry these items is arguably the worst mistake one can make when planning for a long distance trip during winter. It’s hard to get help from passing motorists since most people stay indoors due to the cold. Even if you do spot a driver once in a while, it’s almost impossible to find someone who’ll lend you a tire. Why? Because most people travel with just one spare. The car jack is equally important. However, unlike a spare tire, you’re more likely to find a driver who’s willing to lend you theirs. Make sure it’s well-greased for better performance. When driving at night, one can run over broken glass or sharp nails due to limited visibility. If you have a toolkit, then plugging your flat tire will take about five minutes. However, you need a refill in order to get the tire in the right shape for movement. What do you need to get moving again? A flat tire inflation canister. It restores your punctured tire for 48-72 hours. That’s enough time to look for a tire shop and get a replacement. In order to get the best results, store your canister below 120F. As a driver, you need the best visibility on your windshield while driving. How do you achieve this? By ensuring you have a high-quality washer fluid. Preferably, an all-season wiper fluid. Generic cleaners tend to freeze during winter and this can ruin your squirters. Perhaps you’ve watched a YouTube video of a random person making a DIY wiper fluid at home. Is this safe? No, it isn’t because you end up inhaling unhealthy amounts of ammonia whenever you clean your windshield. Plus, since there’s no titration involved, one ends up creating a caustic solution that corrodes paint near the windshield. Antifreeze keeps your engine running consistently for long hours by preventing overheating. During winter, the freezing temperatures may transform water in your engine to ice. When this happens, your engine overheats because antifreeze requires water to get rid of excess heat. The good news is that you only need one bottle in your kit. Engines usually require an antifreeze change after five years. The Hybrid-based brands last up to five years and are poor electrical conductors. This prevents them from corroding your engine components. Let’s assume you’re driving on an unfamiliar road that’s known to get terrible when it snows. Suddenly your car flips over but there aren’t any serious physical injuries. However, you and your passengers are trapped upside down and you’re worried that an oncoming driver might run into you accidentally. What’s the best way to free you and your passengers? Using a car escape tool. It enables you to cut through seatbelts with just one swipe. Make sure you buy a spring-loaded tool because it helps you to break a car window even when you have a broken hand. It may seem a little bit weird carrying rolls of maps when you can fit them all inside your phone courtesy of a navigation app. Well, what happens when your phone runs out of power and you have to get to the destination by nightfall? You’ll just have to rely on a traditional map for directions. Make sure you buy the most recent map to avoid getting lost. It also helps you identify the best alternative route to use when you come across an unexpected roadblock. Plus, you don’t need any source of power to use the map, unlike navigation apps. A GPS unit comes in handy when you have poor map-reading skills. Just like a navigation app, it uses satellite technology to display your location. This makes it easier for you to keep track of your movements and find out whether you’re heading in the right direction. Unlike a cellphone, a GPS unit retains power for longer hours since it only serves one function. You’ll come across two types of GPS units. One uses Gridmaps to display your routes and this requires some background knowledge. High-end units allow you to download ordinary maps straight from Google. In emergencies, you need a source of real-time information. It helps you know which roads to avoid when a blizzard hits areas near you. You get to know more about the area you’re in by noting down the names of places mentioned by radio presenters. Plus, you also find out how far the rescue teams are from your site. A hand crank radio is best suited for emergencies because it doesn’t require external sources of power. Just crank the lever for about five continuous minutes and you’ll have enough juice to keep the radio powered for about an hour. A solar battery enables you to use your cellphone or tablet for longer periods by keeping your batteries juiced. This enables you to keep your friends and followers updated during disasters by sending videos and tweets regularly on social media. You can respond to police and other emergency responders trying to find their way to rescue you. Solar battery chargers are relatively affordable. The bigger the size, the more devices you can charge simultaneously. In order to extend your charger’s life, avoid placing objects on top of the panel. You need to maintain your hygiene while waiting for help. Carry a toothbrush, toothpaste, soap, and wet wipes to stay clean. Also, carry a separate plastic trash bag to dispose of your items after use. Is Your Credit Score Affecting Insurance Rates?